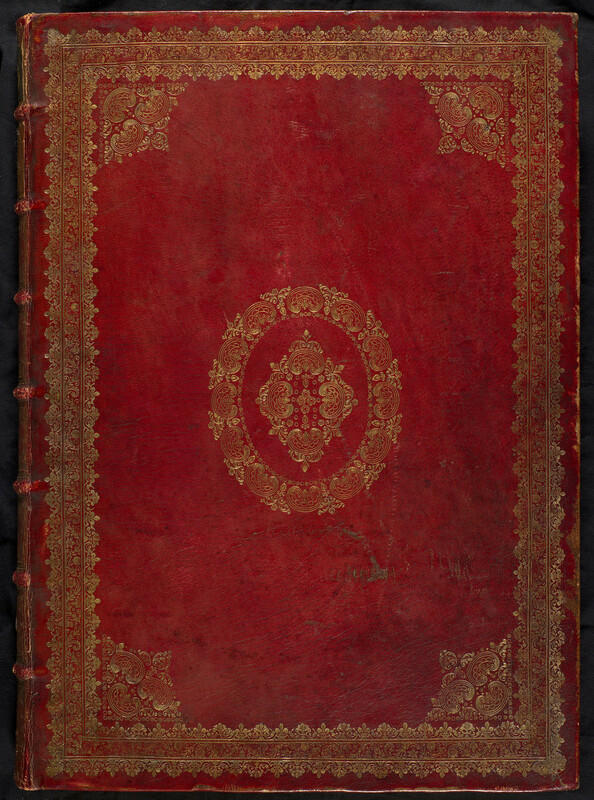 A full-bound red goatskin volume with gold tooling. Inside, marbled endpapers, a watercolour frontispiece by Antonio Visentini of Smith's coat of arms, a watercolour titlepage and a portrait print of Ricci by Giovanni Antonio Faldoni. The album contains 211 drawings and 2 etchings by Ricci, pasted into the volume with wash-line borders to match the tonal qualities of each sheet. The drawings are organised roughly chronologically and are mainly preparatory studies for Ricci's commissions from about 1716 (after his return to Venice) until his death in 1734. Some drawings are marked on the verso with a number and 'JS', probably in Joseph Smith's hand. Another album containing 133 drawings by Sebastiano Ricci is in the Accademia, Venice and belonged to Smith's fellow collector Anton Maria Zanetti. It is likely that they acquired the drawings from Ricci's studio after his death, and both had them bound up in a Venetian bindery. The album was in its present form by 1749, as it was mentioned that year by Pietro Ercole Gherardi (1687-1752) in a description of paintings belonging to Smith.